There has been no shortage of literature on the great Gordie Howe over the many years. 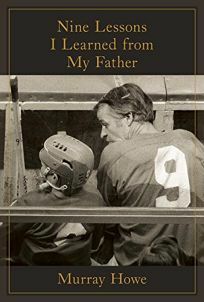 But I do not think I enjoyed a Gordie Howe book more than son Murray Howe's tribute Nine Lessons I Learned From My Father. It is a most unique look at "Mr. Hockey." Written by Murray Howe, the youngest of his three sons and the only one who did not follow his father into professional hockey. “I am still in awe at the thought that Gordie Howe was my father,” he writes. Yet he teaches us that Gordie was just like any one of us, and that we are all capable of extraordinary things. Gordie Howe's true calling was not to be the greatest hockey player ever, which many will say he was. Howe's true calling was to be "Mr. Hockey," and as such the game's greatest ambassador. Murray Howe wanted to be just like his hero - his father. He did not want to be a hero like Gordie Howe, gladiator of the rinks. He just wanted to be like his dad - the amazing man off the ice that most of us never really knew. It is quite the moving read. There are some great stories about Howe the hockey player, but even more about Howe off the ice and, especially, Howe the family man. His battle with health and aging are well chronicled. This is the truest look into an extraordinary life. On a personal note I wish I had read this book before I became a step dad well over a decade ago. I spent a lot of time trying to be something the girls would be proud of - a published author who worked with Hockey Canada, the NHL and Canadian Museum of History. On top of that I tried to be a remarkable runner. It was all intended to teach them that with hard work anything is possible. But as the younger Howe tells us in this book it wasn't the fact that his dad was who he was that made him a great dad. Through the nine lessons he teaches us its far more important to be present and buy ice cream. That's what makes you a hero in your kid's eyes. Check out this MacLean's article featuring Wayne Gretzky interviewing Murray Howe. It in itself is a fantastic read. Be sure to watch for the bookstore on shelves this holiday season. Got to agree with you, Joe; a well crafted book...once again, the acorn did not fall far from the oak.